Abdul Kitata (in yellow) and co-accused at the military court in Makindye today. The leader of Boda-Boda 2010 Abdullah Kitata alongside 11 others have been remanded to Luzira prison until February 27, to allow defence lawyers more time to talk with their clients. Appeared before the General Court Martial at Makindye and charged afresh with offenses of unlawfully possessing firearms and Millitary stores Kitata and all the 11 suspects refused to plead to the charges before the 7-member court chaired by Lt. Gen Andrew Gutti, saying they are not millitary officers to be charged before an Army court. This prompted Lt. Gen. Gutti to warn the suspects that he would charge them with contempt of court. Kitata and group were represented by counsel Joseph Kiryowa and a UPDF provided lawyer Capt. Brian Mogi whereas the state was represented by Maj. Rapheal Mugisha. Kitata and co-accused have been in jail at CMI headquarters in Mbuya, Kampala and at Kigo government prison since their arrest on January 21. Meanwhile 2 accused persons ; Swaleh Ngobi and Ibrahim Sekajja have not been brought to court by prison authorities from Kigo prison. Court heard that on January 21, at Vine Hotel in Wakaliga within Kampala city , Kitata , Sekajja and Ngobi while in Motor vehicle Reg. Number UAK 135B and having no valid firearm certificate, were found in possession of an SMG gun, 3 pistols , 59 rounds of armitions, Millitary head gears and uniforms all which prosecution says are ordinarily a monopoly of defence forces . 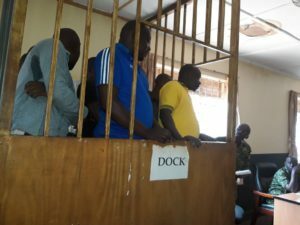 Kitata and co-accused were first charged before the Millitary Disciplinary Unit in Mbuya, but were on Friday last week committed to the General Court Martial which has jurisdiction to try such capital offenses which are punished by death and life sentences respectively.